There is a treasure trove of historic buildings, sites and objects located throughout Erie County. Here is a sampling of what you might find on your travels. It was in 1915 at the height of the American Architectural Renaissance movement when the Corry Post Office was constructed. Built in the Neo-Classical Beaux-Arts form, the building is extremely ornate and was the most expensive postal building in the country when it was built. Visit the Corry, PA website for additional information and a virtual tour of downtown Corry. The Albion Carousel was built by the US Merry Go Round Company of Cincinnati, Ohio in 1890. 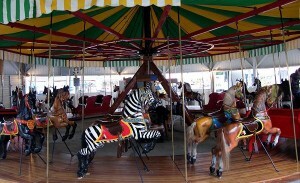 The carousel was originally horse drawn, but has been modified and is powered by an electric motor drive. It is enclosed in a wooden building and is open to riding the second week of September during the annual Albion Fair. After being in operation for ten or twelve years, the decision was made to construct a canal that would connect New York’s Erie Canal with the Pennsylvania Main Line, Lake Erie, and the Ohio River. Construction of the Erie Extension Canal began in the 1830s and was completed for shipping to the port of Erie in 1844. The canal ran through five northwestern Pennsylvania counties and brought new prosperity to northwestern Pennsylvania and provided a safe and reliable means of moving goods. The collapse of an aqueduct near Elk Creek Gorge marked the end of the Erie Extension Canal. The collapse occurred at a time when railroads were becoming a popular and economical means of transportation. 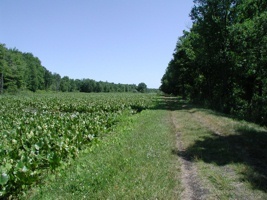 Click HERE for more information on the Erie Extension Canal Towpath Trail on State Game Lands near Linesville, PA in Crawford County. 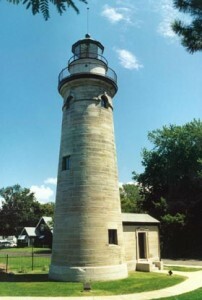 The first Erie Land Lighthouse was lit in 1818, sharing the distinction with the original Buffalo Lighthouse as the first on Lake Erie. Structural instability of the original 20-foot tower led to construction of a new 56-foot tower in 1858. This tower also proved unstable. An engineer’s borings of the area revealed a layer of quicksand deep below the surface. The new tower, a 49-foot tall sandstone structure with a massive foundation, was completed in 1867. The new lighthouse served until 1881, when it was deemed unnecessary, shut down, and the property sold. The Lighthouse Board later decided that the light was still needed, and bought back the property in 1885. The tower was raised seventeen feet in 1897 and served an additional two years before it was permanently closed. The South Shore Wine Company, established by William Griffith and Smith S. Hammond in 1864, was Erie County’s first commercial winery. The original stone wine cavern, built in the 1860s and fashioned after French wine caverns, is one of very few of its kind in the United States. After Griffith’s untimely death, the winery continued operation under various owners and winemakers for many years until the Prohibition halted production in the 1920s. 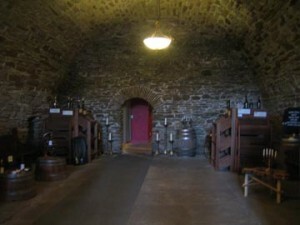 In fact, the South Shore Wine Company was one of the longest running wineries in Pennsylvania. The original blockhouse was built just two years prior to the arrival and death of General Anthony Wayne in 1796. General Wayne’s remains were buried on the property, but in 1809 the Wayne family requested his body be exhumed, transported to Radnar, PA and re-interred in St. David’s Episcopal Church cemetery. Upon discovering the general’s remains intact, the physician overseeing the exhumation made alternative plans for preparing the body for transport. The general’s remains were dissected and flesh and tissue were rendered from the bones. The bones were carefully placed in a box for the long journey from Erie to Radnar, while all of the general’s other “parts” were re-interred on the blockhouse property. The original blockhouse was destroyed in the 1830s. During the 1880s, the current blockhouse was constructed as a memorial to the late general and was renamed the Wayne Blockhouse.